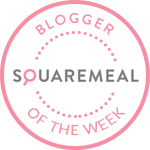 Chickpeas are comfort food especially when used to make chole , a spicy chickpea curry best devoured with steamed rice. 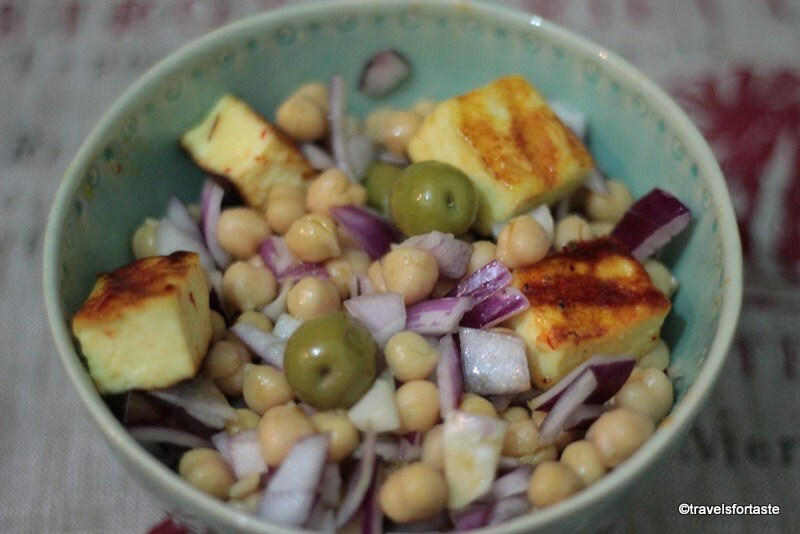 But chickpeas also taste great in salads and because they take up various flavourings so easily , they are perfect ingredients to be used in quick ,filling salads like my Chickpea and Olive salad with sweet chilli Paneer. 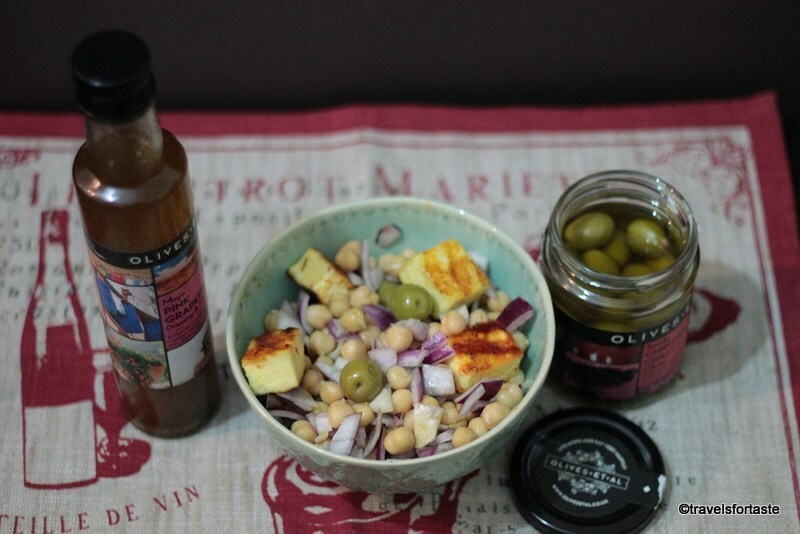 Smoky Chipotle Chilli Olives – marinated in Extra-Virgin Olive Oil naturally infused with Chipotle chillis. 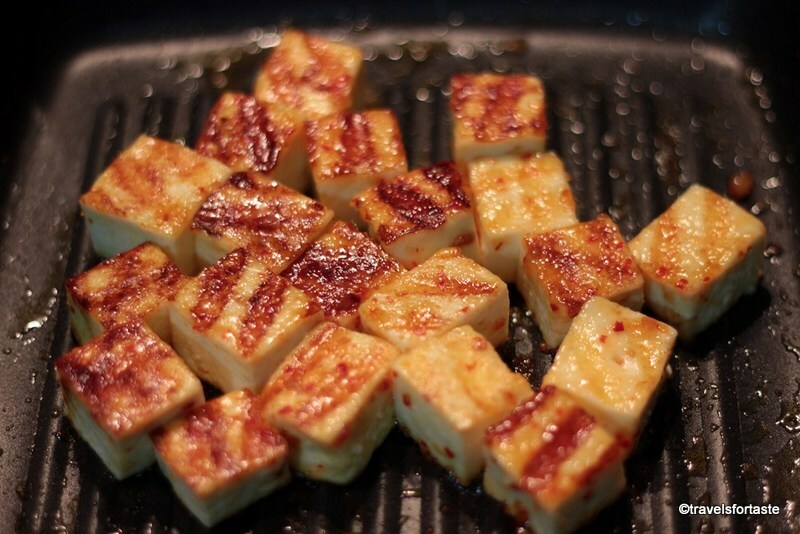 Cut the slab of paneer into large chunks so that they do not crumble. Heat a griddle pan on a low flame and add 2 tbsp of Olives et al Sweet Chilly Billy Jelly Chilly and Ginger Relish to the pan , spread using a wooden spatula . Place the paneer gently on the chilli relish and allow the relish to caramelise and harden then flip and give the the other side of the paneer cubes the same treatment. This will give the paneer a delicious sticky and crunchy coating with just the right flavouring. In a large mixing bowl add the entire can of chickpeas and pour some of the salty water it is preserved in over the chickpeas. 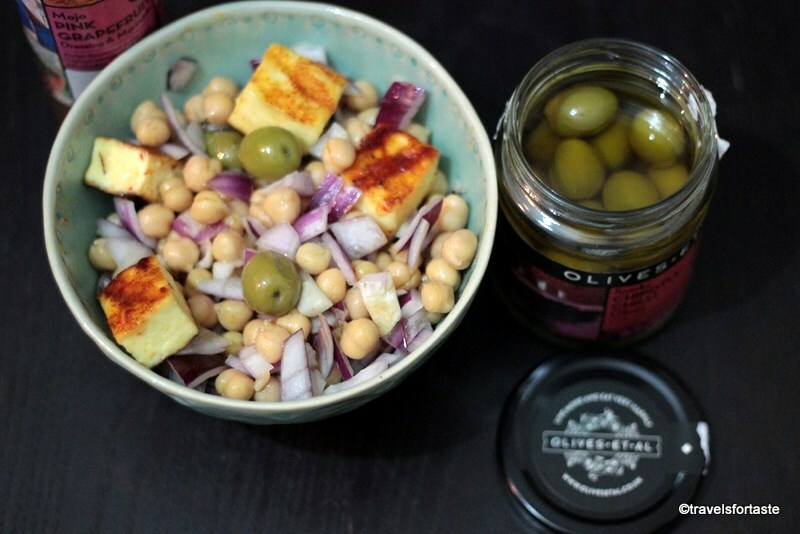 Toss in a few olives and pour a small amount of the chilli oil they are marinated on over the chickpeas. Garnish with sea salt to taste.Mix well. Then add the sticky paneer cubes . Mix gently using a wooden spatula. I then poured a very small amount of the Olive et al Mojo Pink Grapefruit dressing and marinade over the salad – a perfectly beautiful dressing described on the Olives et al site as – ‘Inspired by a Caribbean sauce from the Cayman Islands known locally simply as Mojo Sauce ….Happily unusual, wonderfully versatile and loved by all’ Now I know why its a best seller ! I would have loved to garnish with finely chopped cucumber but sadly my vegetable tray was quite bare that day but do feel free to add a generous amount onto the salad . Coriander marries well with chickpea in any form. 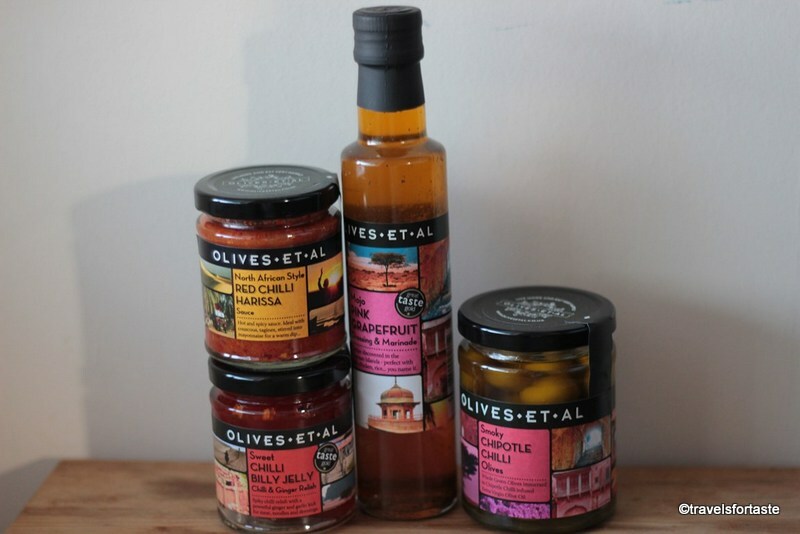 While browsing the website I noticed the beautiful logo for Olives et al and read the fabulous story of how this multi award winning company was born In the early 90s , brain child of Annie and Giles Henschel who embarked on a year-long adventure that would be the inspiration for Olives Et Al. Travelling on motorbikes through the Mediterranean, the Middle East and North Africa, they fell in love with the food we ate along the way and gathered many precious recipes along the way. They launched Olives Et Al in 1993 to satisfy their own culinary cravings and to share quality olives with a wider audience. They began producing Marinated Olives using some of their “souvenir” recipes. Over time, their range of products has grown and now includes, Oils and Balsamics, Speciality Olives, Sauces, Snacks, Kiln Roasted Nuts and Dressings and Marinades – all made in Dorset and free from free of artificial colouring, flavours or preservatives. 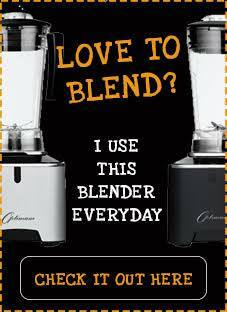 Their products can be purchased directly from their website or in delis across the country and in various food stores. With thanks to Olives et al for the complimentary samples. No monetary compensation was offered for a positive review . As always all opinions expressed here are entirely my own.